Spork In The Eye: Pardon me, but can I borrow a half cup of crazy? I have failed you. I really should follow the signage on crazy vet guy's office more. I have posted one example in the past, but this guy... he takes the crazy cake. I snapped this one today: There is really nothing funnier than when someone unknowningly insults themselves. I've argued with religious folk before that the absolute pinnacle of their value system was suffering, non-self and martyrdom... and just how completely backwards and wrong that is. A lot of them will argue and actually say their beliefs are based on some amount of selfishness or self love -- and while that isn't at all compatible with the bible, it is at least a breath of fresh air to hear them have some sense that there is good in putting their own interests first. But this pretty much sums it up. The purpose of life is to suffer and die and worship martyrdom. Wow. How about the purpose of life being to prosper and live? I have not read anything that was so ethically backwards since I read the story of Adam and Eve. This rates 10 of 10. The sign is put up by a religious person. Not me. 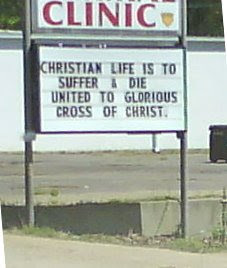 The sign is, in my belief, biblically accurate. I am not sure if your opinions are meant to be anti religion, anti Christian, or anti organized religion. My faith (which I categorize as moderately evangelistic Christian) is not about suffering, but about believing that there is something bigger than ourselves. I feel no such compulsion to suffer, but I do feel led to "love on" people, to share, to help, and to be charitable. I will not argue that many people who wear the Christian tag give the unchurched a lot to poke fun at...heck I even laugh at some of them myself at times, but if you judge all by the actions of a few (even though those few get all the attention) you miss out on the real meaning of the Christian faith. I'd argue my point, but previous experience has told me that doing so is not productive. Yeah, I'll have a Full Gospel with a half order of fries.... or wait... are those crazy fries?? I get it, don't worry. Og, you're going into the big deep fryer in the sky with me... I wasn't expecting you to be overly offended.